The perfect spot to grab some beach day grub before hitting the sands of Long Beach is Lido Kosher Deli. Serving up everything from the indulgent Wally’s 8 ounce juicy Burger Supreme served with French fries, coleslaw and a pickle to healthy options like their vegetarian falafel or Israeli salad. 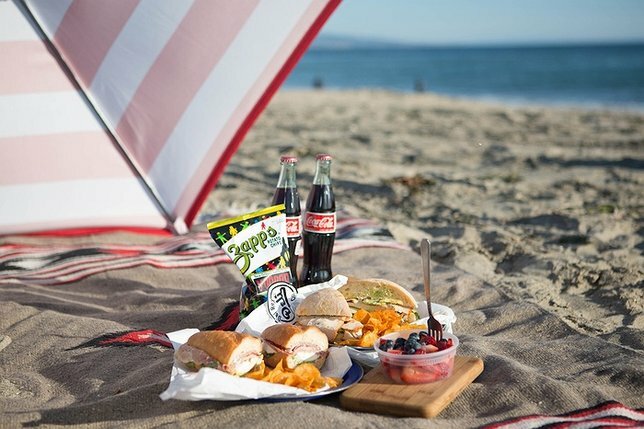 Other great options for tasty beach grab-and-goes are their fresh made wraps, and for those looking to crush some serious eats under the sun? Go for Wally’s famous Knishwich, Lido’s classic knish sliced and stuffed with pastrami or corned beef. Stop in before you board the Shelter Island ferry. Located just near the station, Sterlington Deli is known for their delicious breakfast specialties as well as its sandwich menu. Perfect for some pre beach swimming, The Hungry Man breakfast sandwich is stuffed with three eggs, bacon, ham, sausage and cheese, sure to keep you filled all day. Sterlington also offers on-the-go boxed lunches with tasty options like fresh grilled veggie wraps and turkey and Swiss on a roll. We like to think of Marie Eiffel Market as a taste of France right here on Long Island. Shelter Island’s old homes and gorgeous views transport visitors to another place and time. The ideal beach breakfast can be found at the market with options like yogurt parfaits, organic eggs on a roll and fulfilling breakfast burritos. Inside, Marie Eiffel’s decor resembles a French-style cafe with a chalkboard menu and shelves full of jfresh made ams. For those looking for something a bit more fulfilling for lunch, go for the vegetable goat cheese wrap or Parisian sandwich (Gruyere, French ham on a buttered baguette). All of Marie Eiffel’s menu options include a range of house made specialties and gourmet staples. Take a five-minute drive from Harborfront Park in Port Jefferson for sandwiches that are sure to impress. The Matz, named after the former Ward Melville high schooler who grew up to be a NY Met, is a crispy chicken cutlet sandwich topped with melted jack and cheddar cheese, bacon, lettuce, tomato and pepper house dressing on a toasted garlic hero. Se-Port also offers power bowls with your base choice, protein pick and toppings, perfect for transporting right to your beach setup. Other light-bite options perfect for enjoying under the sun are their fresh made acai bowls and chopped salad bar options. With three locations on Long Island, Seaqua has you covered for whatever you might be craving for your water view dinging. From bagels to salads and sandwiches to wraps, Seaqua has you covered. If breakfast is your move, try one of their specialty egg sandwiches like the Hungry Man (3 eggs your style, bacon, ham, cheese and home fries on a hero). Other easy grab-and-gos are their fresh baked yogurt muffins and assorted bagels. For those looking for a healthy light option, try their Anchor Sandwich (Cajun chicken, pepper jack cheese, grilled red peppers, lettuce and cilantro chipotle sauce on a crispina) or indulge with their Long Beach Press (crispy chicken cutlet, bacon, red onion, grilled red peppers, cheddar cheese and ranch dressing on soft focaccia). Seaqua also makes refreshing smoothies, perfect for staying cool under the sun. Subject: LongIsland.com - Your Name sent you Article details of "Five Long Island Delis Serving Up The Best Beach Eats"